WiFi is free and you can access it throughout the property. perfect opportunity to explore this area of outstanding natural beauty, on the edge of the New Forest National Park. To ensure the peaceful relaxing break our guests are after it is our policy that we do not accept children of any age or pets. Greenbanks 2 is ideal for two people and is fully equipped with everything you could need for a break in the country of walking, riding, cycling and more. If outdoor activities are not your cup of tea, this New Forest holiday apartment allows you to enjoy the spectacular views of the Damerham countryside from your very own patio.The garden is alive with wildlife from badgers and deer, to our own chickens who will lay you fresh eggs for your breakfast. With the New Forest only 5 minutes drive away, Bournemouth and the south coast approximately 30 minutes in one direction and the medieval market city of Salisbury in the other Damerham makes an excellent base for your perfect getaway.You can enjoy wonderful sunrises or sunsets from your own patio. Just turn up, relax and let your holiday begin. Hello My name is Carol Vincent and I am married to Barry. We have been married for over 30 years. We have 1 son James. 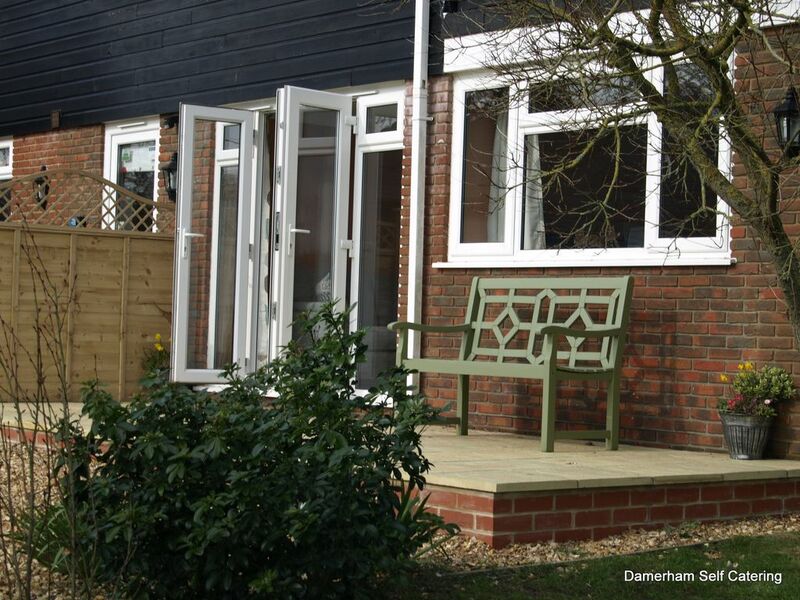 We have been running Damerham Self Catering since 2013 with many guests returning year after year. We enjoy nothing more than to meet with our guests at the end of the day over a cup of tea or a glass of wine and chat about the day, that's why most of our guests leave as friends... but if you prefer not to chat that's ok with us. Greenbanks is set in what we think is a perfect village location. We used to visit friends who lived in the village and once we arrived we were under the spell that Damerham casts over you and we never wanted to leave. There is always something to enjoy in the village. We have Snowdrop Weekend where you can admire the snowdrops everywhere, especially around the Church Yard, we have a Duck Race at Easter that runs along the banks of the River Allen through the village, then there is potato day and of course our annual village fair to name but a few. We are lucky enough to have very low levels of light pollution so it is an ideal spot to sit out at night and watch the night sky, maybe even make a wish on a shooting star. The accommodation has a comfortable bedroom with a double bed with all your linen included and plenty of storage space. Your en-suite has a large shower with toiletries and towels supplied. A well equipped kitchen with full size oven and hob, your dining table and chairs allows you to sit and look out of the patio doors. The lounge has a comfortable sofa and a 32" colour TV which leads out of the patio doors and onto your own patio. Sitting on your patio in the morning you can enjoy your morning cuppa watching the sunrise quietly over the trees and in the evening a favorite spot for our guests is by the pond watching the ducklings having their first swimming lessons. We have our own chickens who will lay you fresh eggs for your breakfast. Barry is a keen gardener and enjoys growing lots of veg and salads which are there for you to pick and enjoy, please help yourselves there is always more than enough to go around. En suite Bathroom The spacious bathroom is en suite and is fully equipped with a large shower, toilet and hand basin. We have supplied a few toiletries in the bathroom just in case you have forgotten yours including shower gel, bubble bath, soap, tissues and shower cap. There are electric heaters around the property with individual thermostats so you can make each room as warm and cosy as you like. The bed is made up for you upon arrival and if you are staying for more than a week clean sheets will be provided. The WiFi is available through out the property the code can be found in our guest information book. There are 2 bath towels, 2 hand towels and 2 face cloths supplied and clean ones are supplied if you are staying more than 1 week. We have a built in refrigerator with an ice box at the top. In the cupboards you will find some tea bags, coffee and sugar and some milk in the fridge to make the perfect cuppa on your arrival. We have tried to stock all the dishes and utensils you will need to make your stay home from home. The kitchen is situated on the ground floor with door leading to the garden. The kitchen is fully equipped with an electric oven, hob, fridge freezer, kettle, toaster crockery and kitchen utensils. Our dinning table and chairs is conveniently place by the kitchen with a view across the garden. A selection of books is available for you to use during your stay. We have a large garden around the house and guests are very welcome to make full use of it. There is plenty of seating areas and the vegetable garden is always worth exploring. We do not supply bicycles but guests are welcome to store them in our garage at there own risk. You have your own patio to sit and enjoy the countryside. There are many golf courses around the area. Please do ask for more details. The perfect retreat, leave the kids and pets and pamper yourselves. Very comfortable holiday let with every amenity you could possibly need, spotlessly clean and in beautiful surroundings with a delightful host. Highly recommended! Thank you for taking the time to write us a review they are always very much appreciated. I am glad you enjoyed your stay and found everything you needed. I hope your husband enjoyed his cycle race and was pleased with his time. Hi. Thank you so much for your lovely review it was very kind of you. I am glad you enjoyed your break and hope you left feeling relaxed. I would love to welcome you back again time. The cottage was clean, tidy and very well set out... we will be back again. Congratulations....I do hope she said yes!! I am glad you enjoyed your stay, looking forward to welcoming you back. Very impressed, it had everything supplied you could need. We only stayed a couple of days as other commitments took over but we would love to return for longer. It was so quiet, lovely rural views, the chickens were very funny. All you needed for a relaxed few days. Salisbury was also very interesting. Sorry you had to cut your visit short, hopefully you will return one day and enjoy the peace and quiet here at Greenbanks. Well equipped. Spotlessly clean. Great location. Would have liked to stay longer! The wine and eggs were a lovely personal touch. So glad you enjoyed your stay, I hope it helped you to relax and recharge. Thank you for taking the time to leave us your review they are really helpful and appreciated. Lovely small flat in a quiet village. Equipped with everything you would need and also a lovely garden to sit in. Owner wasn't available during our stay but we did have her contact number and she emailed us when we had arrived to ensure everything was in order.. We would certainly stay there again. Thank you so much for taking the time to leave us your review and I am so glad you enjoyed your stay. I am sorry I didn't get to meet you during your stay but am looking forward to meeting you on your next stay.